Barbara Olsen (Born 1935) has always created art since she was a child for her own enjoyment and amusement. She was born and raised in the San Francisco Bay area. In 1980, she began devoting full time to her artistic career when her three children were grown. Barbara is a fully self-taught artist. A fully self taught artist. She has achieved an international reputation with her style that combines a unique sense of design, shimmering colors, and the storyteller’s the artful skills. Storytelling is at her heart of and her very soul. This former preschool teacher is blessed with fertile imagination which was nurtured by her Irish immigrant father. Barbara uses words as well as images to tell her stories on handmade paper and on canvas. Barbara has a gift to touch the inner child of each of her viewers. She uses a variety of found objects to create unique and colorful images: she transforms dabs of paint, snips of paper, and scraps of fabric into whimsical mixed media collages. People who live with her delightful images or own them talk about the optimism, the good humor, and the evocation of affectionate memories of childhood. 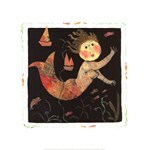 Barbara’s original prints and paintings appear in many well-known public and private collections throughout the world. Featured articles about her art work and about herself have appeared in Americana, America Club (Hong Kong), Country Home, Diablo, Style, Exit (Japan), and American Enterprise magazines. Her work has been on television, in books, magazines, and in numerous newspaper articles. Barbara has exhibited in both group and solo shows and galleries.